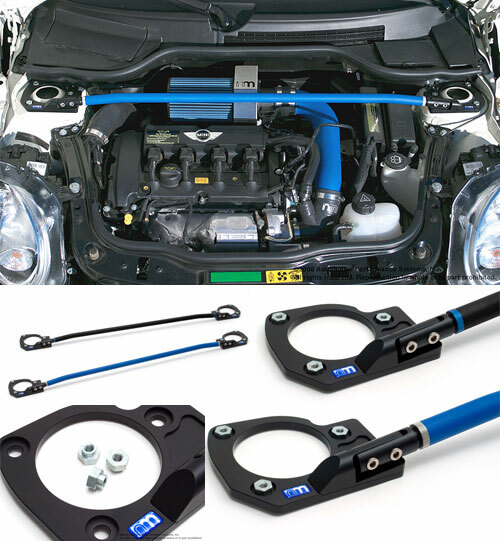 NM Engineering’s Upper Tie-Bar: Gen 2 is designed to reinforce the already stellar MINI Cooper chassis. Installation reduces fore and aft, as well as side-to-side chassis flex during spirited driving, which helps to eliminate unwanted geometry/alignment change. This results in better steering response and better handling. The NM Engineering bar: Gen3 will work with ALL Gen 3 MINI Coopers, F56, F55, 2.0T, and 1.5T. The mounting bases and tube ends are machined from solid 6061-T6 aluminum billets, and not some cheap welded together sheet metal pieces. The bar is formed utilizing a 1" round 6061-T6 aluminum tubing with 1/4" thick wall for the perfect balance between stiffness and weight. While others use a single bolt design we use two bolts to solidly secure the tube end to the mounting base. The single bolt mounting still allows the assembly to pivot and skewed, rendering them ineffective against chassis flex, no matter how tight you cinch the bar end bolt.